Today in History–June 18–the Library of Congress features the War of 1812. 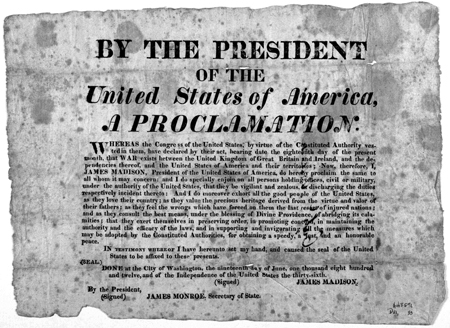 On this date in 1812 President James Madison signed a declaration of war against Great Britain. Reasons for the war included frustration with Britain’s maritime practices and their support of Native American resistance to western expansion as well as a desire to conquer Canada. The war lingered on past 1812 and in August, 1814, British forces attacked Washington D.C., setting fire to many government buildings including the White House and the Capitol building (which housed the 3,000-volume Library of Congress at the time). Learn more by visiting the Today in History section, then click the links below to access more resources and primary sources for the War of 1812 and the Treaty of Ghent, which marked the war’s end.